It all starts with effective warehouse design, which is just one of the services we pride ourselves on here at S.W. Betz. For most companies, the warehouse is the heart – the lifeblood – of the business. A well-designed warehouse, like the heart, works efficiently to pump out products. There is very little wasted energy. Everything has a purpose, a task, and everything is positioned to most effectively perform that task. As a result, the business remains healthy and thrives. Unfortunately, this is not always the case. As they say, time is money. So it is important to make sure your employees use their time wisely. And it all starts with effective warehouse design, which is just one of the services we pride ourselves on here at S.W. Betz. We do more than simply provide warehouse equipment. We pride ourselves in providing the appropriate solutions to your unique application. Of course, we also supply a wide range of materials handling equipment, and the right tools can really make a difference. Pallet racks provide businesses with the means to organize their warehouses, and with the addition of certain pallet rack accessories, this can be done in an extremely safe and efficient manner. Wire bins and containers are a great heavier-duty alternative to corrugated boxes and plastic containers. Conveyors allow for the easy transportation of items, particularly heavier or bulkier items, from one location to another, and are a common piece of material handling equipment found in most warehouses. In a warehouse, there are potential hazards everywhere you turn, from heavy equipment to slick flooring. So it should go without saying that Warehouse Safety is important. According to the U.S. Bureau of Labor Statistics, there are nearly 15,000 warehouse injuries and illnesses annually. Effective warehouse design should take the safety of your workers into consideration. A warehouse not only has to be functional, it also has to be aesthetically appealing. And one of the most affordable ways to improve both functionality and aesthetics is to maximize the existing space in your warehouse. Fortunately, there are several products that can help you accomplish just that. Mezzanines are a cost-effective way to quickly add floor space to your warehouse without the need for costly building expansion. A mezzanine floor system is a semi-permanent, free-standing steel structure that allows you to utilize the unused vertical space in your facility. Modular offices are pre-built modules that fit together to form the perfect, custom office space for your warehouse. This fast and economical solution allows you to add the office space you need without breaking the bank or causing much costly downtime. In order to create the best warehouse possible, get in touch with S.W. Betz today to learn more! S.W. Betz. has been providing businesses in Maryland and beyond with all of their essential Weighing, Material Handling, Dock, and Warehouse equipment since 1933. 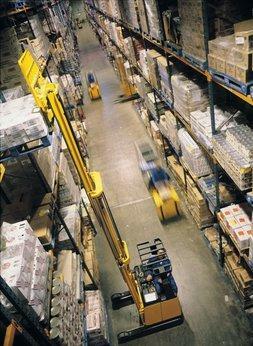 In addition to providing materials handling products, we also help customers design and layout their warehouses. You can count on the S.W. Betz Company to work with you to design a safe and efficient warehouse. If you want to learn more about Warehouse Design, please contact S.W. Betz by calling 410-574-1414 or 800-332-0322 today! This entry was posted on Tuesday, August 4th, 2015 at 9:33 pm. Both comments and pings are currently closed.